Elecampane is known for use in respiratory and lung conditions, including coughs and congestion. 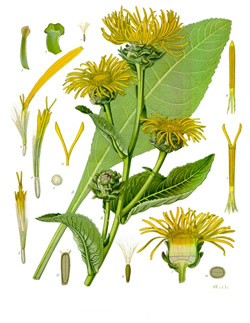 Elecampane is given in small, warm and frequently repeated doses. It is, however, seldom given alone, but most frequently preferred in combination with other medicines of a similar nature. It is best given in the form of decoction, the dose being a small teaspoonful, three times a day. Recipe Instructions: Decoction :Bring chopped roots to a slow boil, cover and simmer for 20 min. Bronchitis :A nagging cough that lingers and causes difficulty in breathing is often symptomatic of bronchitis.